Why connect Migrator.xyz and Asana? Migrator.xyz makes moving from Trello to Asana effortless. Our migrator enables you to import a Trello board to Asana in a minute or less. Follow the progress of your import as it happens in real-time in the Migrator.xyz dashboard or watch as your cards are created in your Asana account. Login to migrator.xyz with your Asana account. Authorize migrator.xyz with your Asana account. 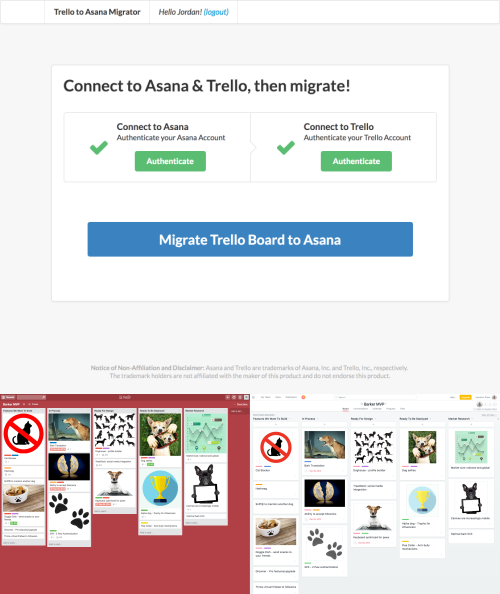 Follow the migration flow to choose a Trello board and an Asana workspace to migrate it to. Follow the progress as the migration happens in in real time. What is Migrator.xyz? Migrator.xyz makes moving from Trello to Asana effortless. Our migrator enables you to import a Trello board to Asana in a minute or less. Where do I go for support? Email Migrator.xyz support.